Yesterday's tantalizing micro tease couldn't have been easy to deal with. All that sparkle, all those colors! I'm sure the glitter welling up from your pedis to your manis was almost too much for a normal lacquerhead to handle. Well, breathe easy ladies, here's your first taste of Sally Hansen's newest line of Jewel Overcoats. This is Multi-Faceted over Something Sweet (China Glaze). Righty models these colors together while Lefty licks its wounds. It's a fact that women can't help but look at shiny things and puppies. Maybe that's why we're terrible drivers or so bad at gambling. I was down $60 by the time we left Vegas on Sunday. Sally Hansen's certainly not doing us any favors by providing us with these overly-shiny overcoats. 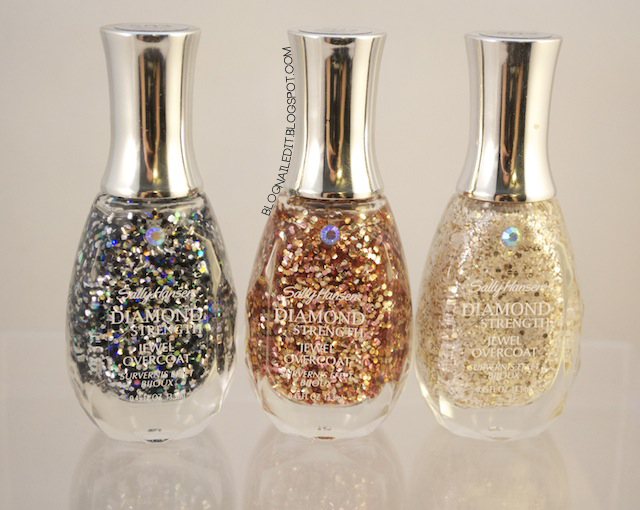 The size of these glitters are perfect! They're all the same size, but the colors range from black to blue to pink, though you'll mostly just catch the silver and black. They stand out without literally standing up (a problem I've heard of girls encountering with Color Club's Back Stage Pass collection). I haven't purchased many big-name polishes recently, but these went into my hands without even looking at the price (a measly $4.99 by the way). The other colors in the collection that I picked up are White Veil and Ring-a-Ding!, though there was one more on display. I have no clue how long these will be around, but if you're a fan of black glitter and sparkle, you better get to shoppin'! Wow your nails look fab!! These sparkles rock. They're a bigger size, so you need less of them to get a good effect. It looks almost like your nails were dotted. VERY much a fan of the one on the right. White veil? I will have to pick it up! Yep, white veil. Originally, I was going to use that over the pink, but it's a little too light to get a really cool effect. I'll try it over something like a deep purple. Go go go! I got mine at Walgreens. I need to go pick this up! Those are gorgeous! Already exceeded my nail polish limit for awhile or I'd be on my way to Walgreens now! This looks beautiful! I need to get my hands on that glitter!